Star Citizen received a huge patch last week, one that added new enemy ships to the Arena Commander mode and made many fixes to its network code. The rubber banding issue’s been solved for multiplayer deathmatches and Roberts Space Industries’ reckon they’ve made gret strides for eliminating it in the final, larger, persistent game. Most importantly, though, there are now flushable toilets. One of the modes in Arena Commander lets you fight in a combat simulation against AI ships. Patch 12.5 adds a new ship type for the enemy Vanduul to pilot against you. This will spice up single player a tad but the real changes come in the form of multiplayer updates. One of the focuses of this patch was taking feedback from the community and balancing the ships for dogfighting. “With top to bottom changes of virtually every tweak-able value on every ship and item what we’ve ended up with is the most balanced multiplayer dogfighting that we’ve had to date,” writes associate producer Travis Day. 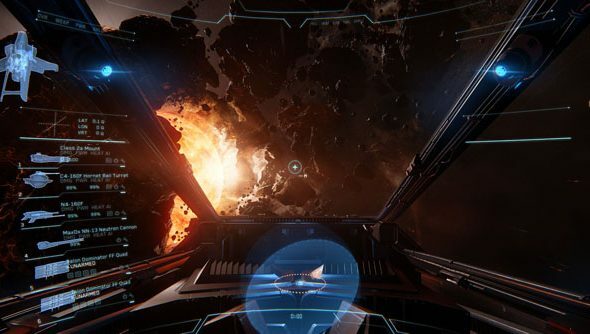 One of the key issues to come out from the Star Citizen alpha is a rubber banding problem. In multiplayer matches each player’s position, rotation, and velocity wasn’t being correctly communicated to each player’s game. In this update RSI say that they’ve “significantly reduced the occurrence of the divergence and also implemented systems to correct it much more quickly and seamlessly.” The problem’s not been solved but greatly improved. Of course, the most exciting update in this patch is the newly added flushable toilets. Winning music no longer plays at match end for losing team. You get nothing, you lose, good day sir. Fix for sound velocity/speed being calculated incorrectly if its position is changed multiple times per frame. I had a terrible time with the initial Star Citizen launch but these patches show RSI are rapidly solving the issues I came across.